^ the lineup. next came the interrogation. The union hall was full — of teachers, especially the union’s activists, and they knew exactly what they wanted to hear. And not to hear. Not surprisingly, some of the eleven candidates on hand — Dan Conley was the absent — told the BTU gathering what it wanted to hear and were loudly cheered and applauded. Quite the surprise was that John Connolly, who pointedly advocates school “transformation — his word — by corporate executives, entrepreneurs, and philanthropists (and by the Mayor), told the gathering exactly that, in well exampled detail. He gave reasons and stated goals, and he did not waver. He was received in almost total silence. 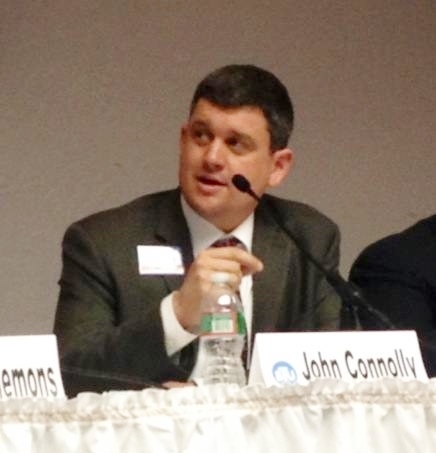 ^ John Connolly stood his ground. David Bernstein — Boston’s premier political reporter (full disclosure: we both wrote for the Boston Phoenix), moderated. Being a playful and even ironic sort, he asked each candidate questions that would be hardest for them to answer; then picked out others of the eleven to give, he hoped, a competing view. It worked at first, but eventually the candidates began to interrupt, or to veer a response toward their agenda . Bernstein tried to cut off such manipulation but was not always successful. As he called upon the eleven in random order, occasionally he forgot one or two. Candidates had to raise their hands to be recognized. The entire 90 minute event looked very much like a teacher and his class; appropriate, I suppose, for a Forum presented for teachers. Still, many issues were raised : charter schools, the longer school day, arts and music, standardized testing (the MCAS), school kids’ health, parent involvement, diversity, students for whom English is a learned language, transportation, school construction and renovation. The diversity of responses was strong and plain to hear. 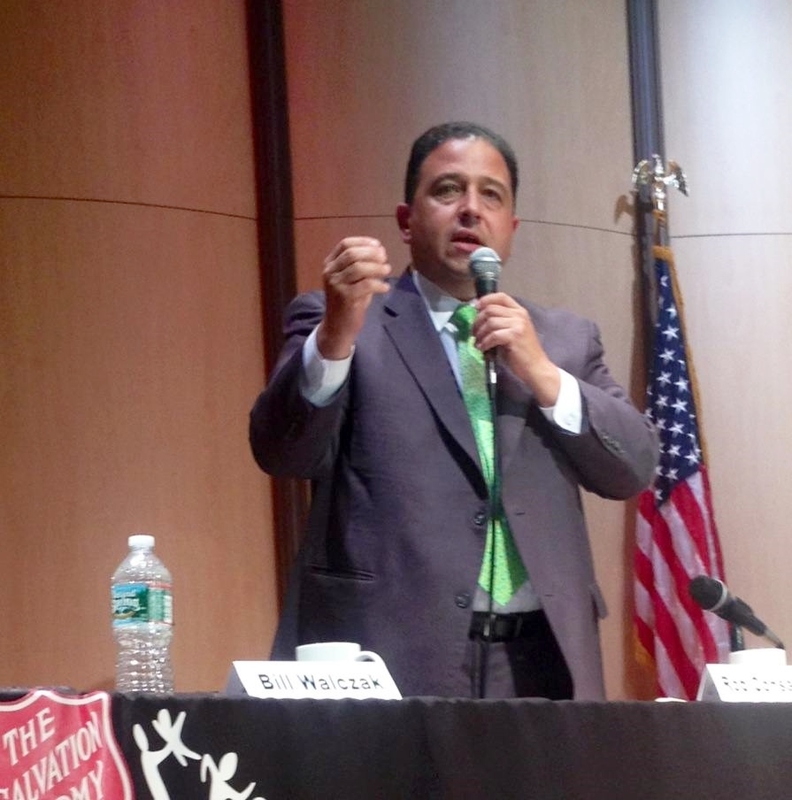 Rob Consalvo told the activists exactly what they wanted to hear, on every issue — charter schools too, of course — and passionately. as passionately was he cheered. 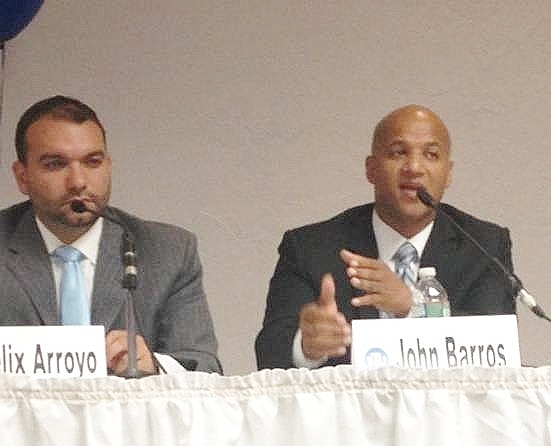 John Barros outlined school reforms and problems with the detail and insight that he has gathered as a member of Boston’s school committee. particularly true was his observation that the public school system has been asked to do what so many of society’s systems have failed to do and that this is unfair to the schools. Barros thanked charter schools for finding new and innovative methods which the regular public schools have then adopted. Bill Walczak did not mention casinos even once. He affirmed his work in connecting the charter school that he created to the city’s health system and saw that as a model for all Boston schools. Marty Walsh, who sits on the board of a charter school, passionately defended the school’s role in creating “best practices” for the entire system to adopt. He rejected the BTU’s assertion that elimination of difficult students is systemic to charter schools. 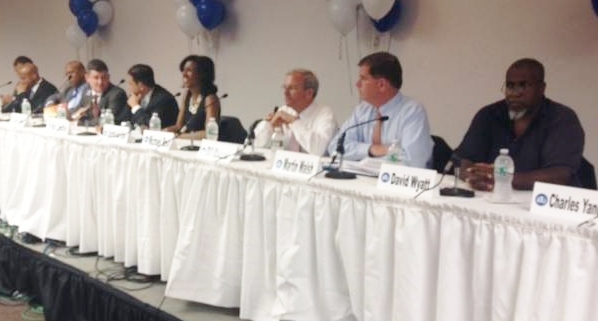 Walsh called for a program of school construction and for a meaningful longer school day. Mike Ross insisted that standardized testing is crucial to assuring that students will acquire core knowledge, and he called for the establishment of a city technology high school, noting that google.com did not open a Boston office because it doubted being able to fill even entry-level jobs with Boston high school graduates. David Wyatt made no attempt to get an answer in if not called upon and, when called upon, said little — he the Stoic; but he did support charter schools for bringing competition into education, and he endorsed standardized testing. Charlotte Golar-Richie was occasionally overlooked but, when she interrupted to speak, supported an arts and music longer school day. As for charter schools, she found them useful but did not find a need to increase their number. John Connolly’s points have already been noted. Felix G. Arroyo reminded the crowd that he is the husband, brother, and son of Boston public school teachers. He emphasized the language diversity, at home, that challenges so many Boston students in the classroom. He also saw an immediate need for arts, music, and crafts in the longer school day, noting how important crafts classes were to him. Charles Yancey came late but made his time count. He called for the building of high schools which, he ranted, had been called for for years but nothing done. He would enforce a 1994 city ordinance granting school parents three days’ leave to visit their children’s schools and reminded the crowd of his mother, Alice Yancey, and how passionate she was about making sure that her son studied and learned. And so it went. 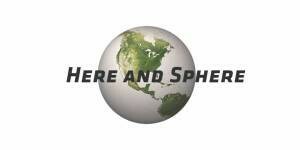 There was the beginning of a conversation about the City’s hugest and most intractable system. But only a beginning; with eleven hopefuls on hand, the school conversation stands at the sorting-out stage. Just as does the Primary itself. That the conversation is just beginning was obvious from the many issues that were not discussed : school assignment reform (and transportation costs), teacher pay, funding school reforms, even the assaults, by students, sad to say, that afflict teachers almost daily. Some of these issues were discussed after the Forum as teachers and various newsies (including me) conversed in small groups. The BTU knows that it is losing the battle of public opinion about school reform. It wants badly to be heard — respectfully but forcefully. I hear the BTU. I have long experience of politics involving Boston schools, and I have nothing but respect for the energy, the poise, the courage of teachers who on every school day face exactly what John Barros said : the problems of society dropped at the school door for teachers and principals to deal with even as they try to perform their teaching mission : the teaching of knowledge. Any school reform that does not find a central mission for the teachers, and pay accordingly, and that does not accord the teachers the last word on creating a curriculum and a classroom format is a reform that begins on the wrong foot. Any reform that seeks to downplay the teacher solidarity that a Union assures them is no reform at all. How can school transformation be a good thing if its first strike is to the one security that teachers, often overwhelmed by school problems, can count on ? Let us seek to make teachers’ jobs easier, not harder. That said, I do not agree with the BTU’s position that charter schools detract from the public schools. No matter what format and curriculum the teachers decide (and I hope it is they who decide), charter schools offer a useful “but look here.” Useful because not even teachers know all that needs be learned about what works to educate. All of the above needs be said, and often. But right now there is voting to be done. So how will the BTU teachers vote ? They are not stupid. They knew who was pandering, who was seeking common ground, and who was confident of him or herself. By no means should Consalvo, who was so noisily cheered, assume that the teacher activists are in his corner. My impression of their cheering — and not only for him — was for the statement, not the candidate. The teachers have a pretty solid idea of who is likely to win and who isn’t. 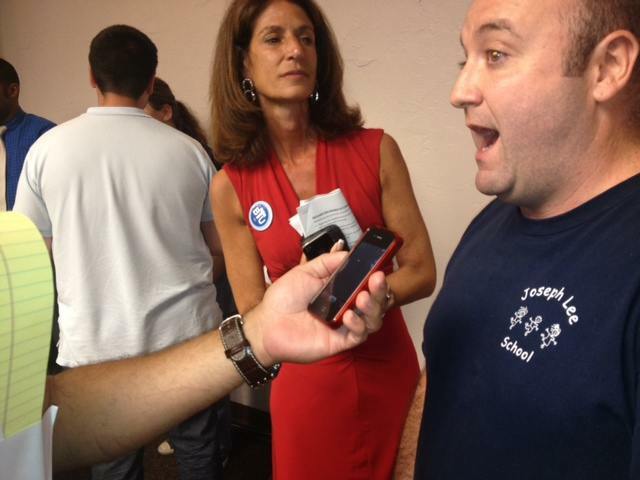 After the Forum, I spoke to several, and they were quite clear about that being a factor in their vote on Primary day. 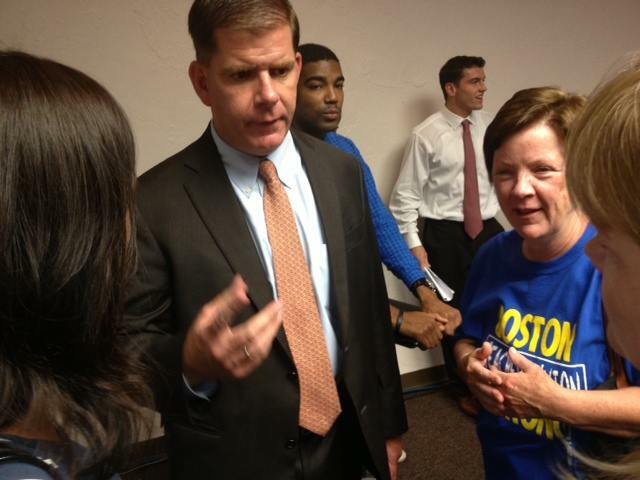 ^ Marty Walsh found friends at a union gathering hours after being slammed as a unionist by the Herald.